Today, there will be an annular eclipse of the sun. 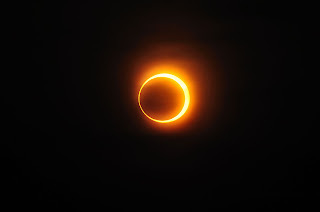 The eclipse will result in a ring of fire as the moon passes by the sun. The Western states will have the best viewing of the eclipse. The Chicago area will be treated to a partial eclipse. I thought that I would supply some links for anybody interested in this event. It is important to not look at the sun to see the eclipse. Also, do not use binoculars or a telescope to look directly at the eclipse. Rather, you can use special solar glasses (not sun glasses) or make a pinhole camera. Here is some information about eye safety from the Adler Planetarium. This also may come in handy when Venus passes by the sun on June 5. Also, check the Exploratorium for information on how to make a pinhole camera. The Huffington Post has an article with a map that will give you an idea about when you will be able to see the eclipse in your area. Unfortuntately, the East will be shut out of this experience! MrEclipse.com has a good explanation of solar eclipses. Some more articles about the eclipse can be found at CNN and Sky & Telescope Magazine. Shoot. I missed it. Didn't know there was an eclipse today. Thanks for sharing the photo.